The Houseflag of Mamenic Line, can be seen at Josef Nuesse site. The flag is horizontally divided blue-white-blue with MAMENIC in blue in the white stripe. Joseph Nüsse shows on his website colour pictures of several house flags of shipping companies. The site is a very good source since it shows pictures of *real* flags. It is clear from his website that Joseph served (and maybe still serves) in the merchant navy and most probably regrets the decline in merchant shiiping. The website disclaimer says that most of the companies whose house flags are shown there are goneout of business. A different item (table flag) was offered on German eBay last year: no. 290374581187 (end 6 Dec 2009) put up by "freie_hansestadt", dimensions given as approx. 15 cm x 25 cm. Photo. Quarterly divided red (top, bottom) and white (hoist, fly), two blue concentric rings in the centre, the inner one enclosing a yellow disk bearing a black foul anchor and the outer one the name in black "MAMENIC / LINE" (top) and "AMERCO CENTRAL" (bottom), the four words divided by the arms of a red slightly widening cross emanating from the inner ring and reaching the outer one. Did the present item perhaps follow the "national" version, and when would the firm have been wound up? Rather "CENTRO AMERICA". I located a handbill with an image of the flag online, and modified the font a bit. The flag is shown at Joseph Nüsse's website as belonging to Linabol (Bolivia) (so reported by António Martins-Tuválkin). 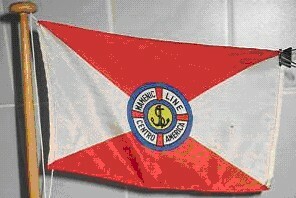 Brown (1995) [Lgr95] lists the same flag as belonging to Naviera Nicaraguense S.A., (Nanica) - only difference is the proportions of the stripes (c. 2:3:2), the blue stripe just blue. Brown seems to be wrong with his Nicaragua-outplacement and this is an erroneous attribution.